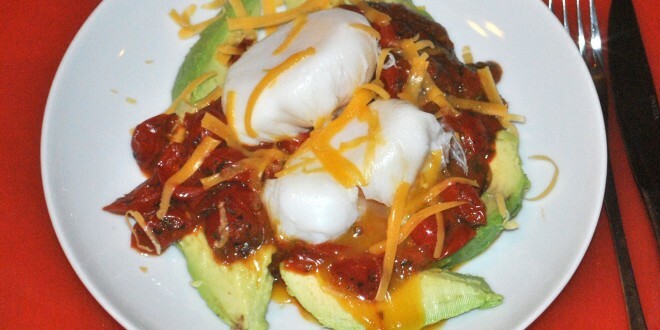 A taste of Mexico tonight – a healthy version of huevos rancheros. 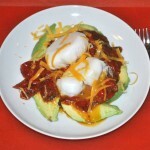 Huevos Rancheros is one of my favourite quick meals. Traditionally eaten for breakfast, it’s one of those ones I could eat any time of the day, and one of my go-tos when I’m late getting home. Sadly the fried corn tortilla in the traditional version makes it something which isn’t particularly healthy to eat regularly. Whilst I still enjoy the real thing as an occasional brunch, I can eat this version whenever I want without any guilt pangs; if anything it makes me feel positively virtuous. Add the oil to a large frying pan or wok and warm over a medium heat. Once warm, add the garlic and saute until you can smell it (about 30 seconds). Add the chopped tomatoes, chilli, vinegar and a pinch of salt and cook over a medium heat for 10 minutes or so until the tomatoes start to go into a thick sauce. have a quick taste to make sure you have enough chilli for your tastes. 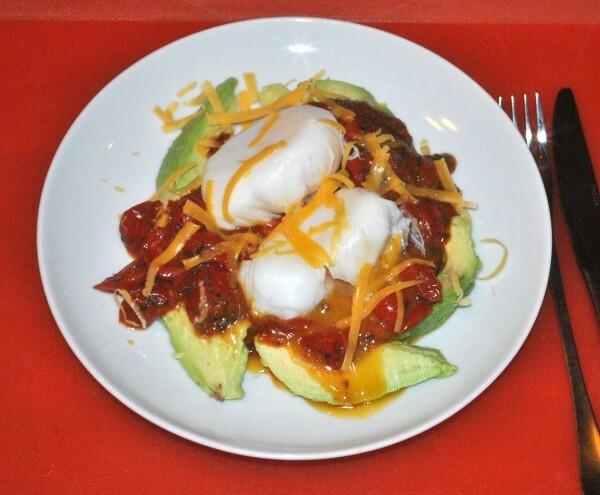 Arrange the sliced avocado on a plate, top with the sauce and the poached eggs. Grate a little cheese over the top and enjoy. I prefer baby tomatoes as they're quick to chop (i just half them) and I like the taste, but you can use any type, or even chopped, tinned ones. I find my wok is ideal for making the tomato sauce. The traditional version of huevos rancheros has fried eggs, as well as a fried tortilla - feel free to use them in this version instead of poached should you wish. Normally I like to offer alternatives for herbs and spices, but in this case only tarragon will do. Luckily it's readily available - I always keep a jar in my spice cupboard. As always, I'd love to know how you get on if you give this recipe a try.